This bespoke kitchen was made to measure including wall to wall fittings and an island unit / breakfast bar with sink. 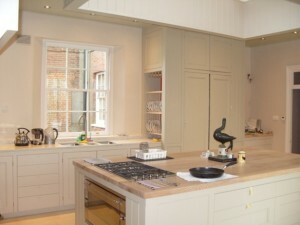 The solid oak worktops contrast with the painted, shaker-style Tulip Wood door fronts. The door fronts were primed in the workshop, to be painted by hand in-situ during the installation. All cabinets to include soft closing door runners. Cabinet doors were hung using traditional hinges and false doors were crafted for hidden appliances. The initial plan for the kitchen was supplied as a simple line drawing. Bullen Joinery is pleased to be able to offer a full kitchen design service, without the need for our clients to supply architect’s plans.